Kuala Lipis is a town in Pahang, Malaysia with a population of 20,000. It is located in the district of Lipis.Kuala Lipis was a gold-mining center before the British arrived in 1887. In 1898 it became the capital of Pahang until 1953. During this time, grand colonial buildings, such as the imposing District Offices and the Clifford School, and the Pahang Club were built. The hilltop house of the British Resident is now a hotel and museum. The town grew and prospered with the coming of the railway in 1924. However, in August 1955, the state capital was shifted to Kuantan, and Kuala Lipis fell into a decline. It is now a sleepy and picturesque town with reminders of a once important past. Hilltop house of the British Resident. Hilltop house of Bukit Bius. 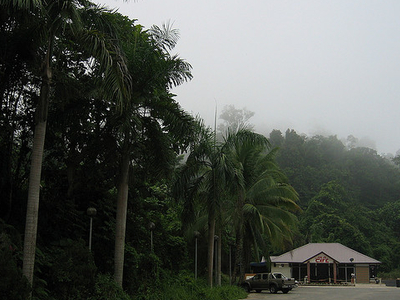 From Kuala Lipis you can go to Kenong Rimba Park, which is about 10 km away. It is a forest reserve, accessible by train or boat. It is a good place for trekking and caving. There is a KTM Train Station in Kuala Lipis near to Jalan Pekeliling, main road of Kuala Lipis town. From the town, you take a bus or cab for 30 minutes journey to Tanjung Kiara Jetty. From here you either can walk (trekking) for about one and half hour to base camp or take a 4 wheel drive for only 20 minutes. Activities: There are several activities can be done at this park such as caveing, jungle trekking, night walking, hill climbing, birds and animals observation. Here's the our members favorite photos of "Towns & Villages in Pahang". Upload your photo of Kuala Lipis!